Club training sessions take place Tuesday evenings at Lancaster University Astro Turf pitches. Senior team training will commence on Tuesday 4th September 2018 and will run until Tuesday 12th March 2019, apart from 18th December 2018 to 8th January 2019 inclusive. The sessions will be run by a Level 3 coach from 18:30 to 20:00. 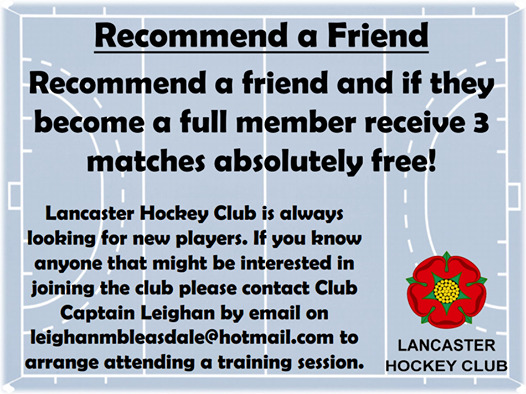 New players are always encouraged to join Lancaster Hockey Club and will always be made to feel truly welcome at our Tuesday night training sessions. The Club has four senior women's teams that suit all abilities and ages. If new members do not wish to play in weekend games or can't due to work commitments then members are welcome to attend training sessions to benefit from the great social aspects the club has to offer. In addition we have a strong Gator's section that offers an environment for boys and girls aged 5-13 to learn about hockey, have fun and develop basic skills before moving up the Club. We also have a girl's junior section that provides a training environment for the development team, U18, U16, U15, U13 and U12 girls squads. This website should provide you with all the information that you need but if you have any queries please contact Leighan Bleasdale and she will be happy to help. At Lancaster Hockey Club we offer a variety of membership packages to suit our different members. Membership fees are used to pay for our qualified coaches, pitch costs, competition fees, insurance, affiliation to England Hockey and the general running of the Club. *£10 discount applied if member attended 2018 AGM. Gator's Members - £25 per training block of 8 sessions. The following membership package requires additional payment of £3.50 per training session. Social Members - £25 (Applications for Social Membership must be made in writing to Lancaster Hockey Club Committee). To obtain a membership form please contact Emma Wood.